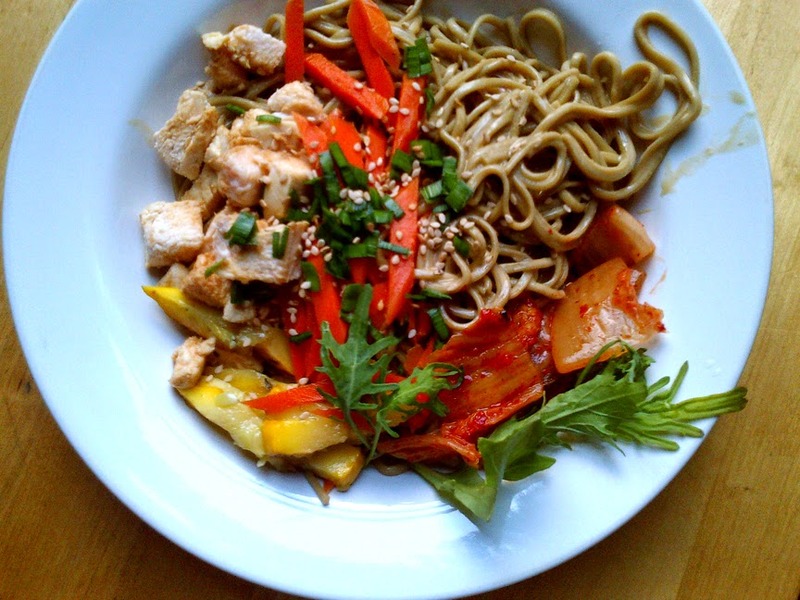 Kimcheelicious: Non-recipe: Cold Kimchee-Sesame Noodles! Considering that a good portion of our country is going through devastating drought conditions, I shouldn’t complain about these few days that have been above 90°F in New York. Maybe I should be thankful; it inspired this jaw-dropping delicious dinner: cold kimchee-sesame green tea noodles with steamed carrots and yellow squash, diced chicken and Napa cabbage kimchee. These are all leftovers from this weeks meals. The only thing I made was the sesame sauce with just a little help from kimchee juice. This is not a real recipe, this is more of a serving suggestion inspired by humid, high temperature days and two cups of leftover green tea noodles. I wrote a more detailed recipe for the Kimcheelicous ePUB cookbook (out soon). Make it for Sunday dinner! Make a quick sesame sauce with 3 tbsp soy sauce, 2 tbsp kimchee juice, 1 tsp vinegar, 1/2 tsp honey, 1 clove garlic (minced), 3 tbsp sesame paste (tahini) and a pinch of black pepper. If you don’t have any sesame paste, use creamy peanut butter and little roasted sesame seed oil instead. Mix well and toss 2 cups of noodles with the sauce. If your noodles are clumped together just give them a quick rinse under cold water and drain before tossing. Stick it in the fridge for 15 minutes before serving. For you celiac peeps, use a good gluten-free pasta and check your brand of peanut butter. Kicmhee juice gives these cold, creamy noodles a spicy tart kick. It make the perfect foil for all your refrigerated bits and pieces: salad greens, asparagus, carrots, cucumbers, boiled potatoes, fennel greens, avocado, green beans, tofu, ham, crumbled bacon, deli turkey, shredded chicken... you get the picture. Serve with toasted sesame seeds, chives and Napa cabbage kimchee.